An anchoring system designed to resist horizontal wind loads on the long end-side of the home. 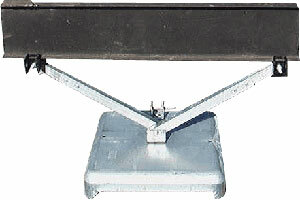 A Longitudinal Stabilizer System placed into the ground at grade level. Once the base plate has been installed, the 2 arms attach to the frame which help resist strong winds from rocking the ends of the home and help slow the rate of settling.